Vacation… What a wonderful word! My sister and I are both taking time off this week. And we’re both staying put, so we’ve decided to go out into the city everyday for lunch, and enjoy a food-oriented staycation. 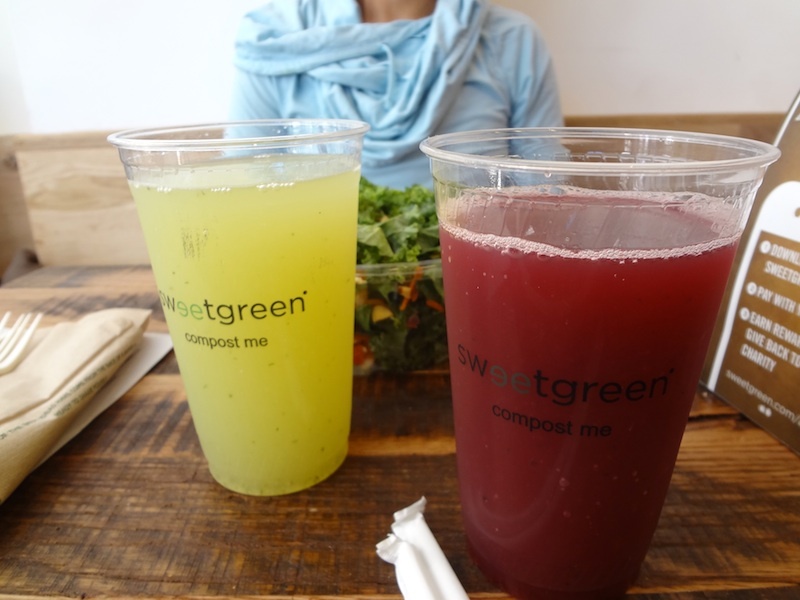 Today, we went to Sweetgreen on Boylston Street. Even though it was my suggestion, I was very unsure if I was going to like this place. Sweetgreen, which has other locations in DC, Philadelphia, and NYC, is a salad bar that sources local and organic ingredients. I love the “local” and “organic” facets, but I freely admit that I’m not a huge salad person. We got there around 12:15p and the line was reaching outside the door. Luckily, most people were taking their salads back to their offices, and the line moved pretty quickly. Still, there were probably at least 20 people in front of us. I went to grab us a table while my sister ordered. It probably wasn’t a necessary step as even the dine-in customers moved in and out pretty quickly. 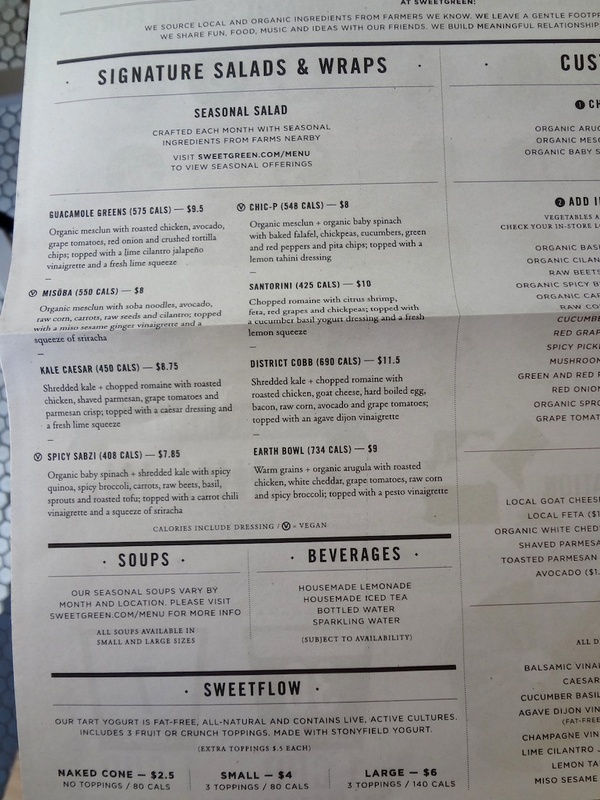 Although I don’t have a photo of it, there’s a chalkboard on the far end of the restaurant that lists where some of their items are sourced from. It’s kind of cool. The second part of the lecture was a short food demo by Carles Tejedor in which he plated oil yogurt (made up of 25% extra virgin olive oil, the yogurt was made pretty via spherification) and some olive oil bread (made up of 50% olive oil, I think he said). It really wasn’t anything that he hasn’t talked about before, so I won’t bother rehashing it. Just enjoy the pictures below. 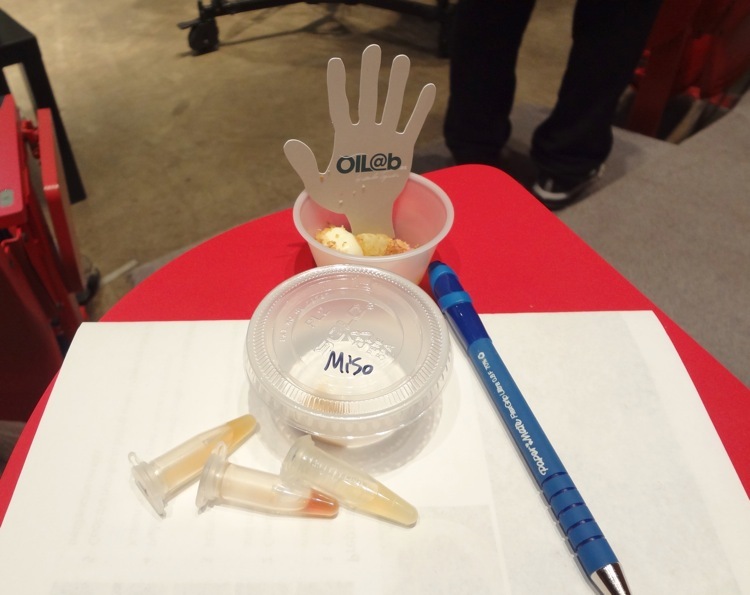 As for audience goodies, we got to try the olive oil yogurt with olive oil breadcrumbs. We also got about 1/2 tsp of cashew miso, and three vials of mystery liquid. The first vial was cashew tare (the fermented cashew juice that separates out post-centrifuging). The second was olive “soy sauce, which tasted like salty concentrated olive juice. And the last vial was fermented olive juice which was very bitter to due oleuropein, a chemical compound which naturally occurs in olive. I thought this was pretty nifty for anyone looking to cook with seasonal ingredients. The Center for Health and the Global Environment at Harvard Medical School has published a quick reference guide for the New England area (and another guide for the Mid-Atlantic area) that gives a run-down of the fruits and vegetables that are in season by month. The aim here is to encourage people to purchase and eat more locally grown produce. which includes hyperlinks to detailed information, like nutritional info and storage info, about the produce of your choice. It’s hard to find, but there are a few recipes posted as well. Luckily for you, I did all the sleuthing so you don’t have to. The natural heat from composting? Blue Hill has been experimenting with cooking food, like potatoes, in a compost (don’t worry, the potatoes for eating are sealed in a bag). So, big deal, right? Compost and biochar and selective gardening, it’s all going to taste the same right? Well, *no*. Stone Farms, again with the crazy data compiling, measures the Brix levels in their produce. what is Brix? In the food industry, it’s a way to measure the approximate amount of sugars in fruits, vegetables, juices, wine, soft drinks. The higher the Brix level, the higher the sugar/sweetness concentration. The farm has been breaking common Brix levels every year. Let’s take carrots as an example. The Northeast naturally produces some of the sweetest carrots. Why? Freezing temperatures for carrot plants to convert their starches into sugar for survival. Stone Farms has been able to measure 13.8 on the Brix scale. Out of curiosity, they measured the Brix level of good quality organic carrots not from their farm. The measurement? 0.0 on the Brix scale. Not sweet carrots at all. Dan again emphasized that the farm and the restaurant were seeking out the best tasting ingredients that were raised right. So you might think that Dan is very pro-heirloom tomatoes. It’s all the rage these days in farmer markets, heirloom plants. Dan sounded kind of “meh” on them. He showed slides entitled “Magic Mountain Tomato” and showed us the unnamed hybrid tomatoes that the farm and restaurant were getting from Cornell University. Probably one of the slightly weird food experiments at Stone Farms is “hazelnut celtuce.” The experiment started with carrots, actually. They tried seeing if they could infuse the aroma of hazelnuts into carrots by using residue hazelnuts in the soil. It failed because the cell walls of carrots are too thick. They tried again with celtuce (which is a type of lettuce) which has thinner cell walls. The answer was yes, the aroma can be absorbed. Dan ended the lecture with a blurb on the Angiogenesis Foundation. The foundation is a non-profit organization that strives to reduce diseases by restoring balance to blood vessel growth. Somewhere in there is the idea that foods can battle cancer. Dan believes that food through the Stone Farms’ sustainable methods are more nutritious than their supermarket counterparts, and therefore more likely to have greater value to fighting against sickness. It was a very fascinating lecture from a scientific and nutritional standpoint, and it appealed more to me than I originally thought it would. In my own personal food quest, I have realized that while I eat pretty decently (I don’t eat too much junk), I’m eating things that should or could have more nutritional value. It’s hard to think that “yes, there is such a thing as good fat with a nutritional purpose.” It’s a departure from what I’ve heard growing up. I’m starting small – I’m moving from store bought milk to grass-fed raw farm milk. This is hard to do in the state of Massachusetts when you don’t have regular access to a car, and the state forbids the selling of raw milk in stores or via buying clubs. However, I’ve discovered that raw milk freezes/defrosts pretty well and I have a full-size freezer, so I’m hopeful about my efforts. Plus, I can’t hate the idea of helping my local economy when I can. Anyway, only one lecture left this semester! I’m looking forward to it! Last night’s lecture with Dan Barber of Blue Hill/Stone Farm was very different from the previous lectures. Whereas the lectures so far have been about manipulation of ingredients and cooking technique, Dan was there to talk to us about everything that happens before the ingredients even get into the restaurant kitchen. Mike made the audience think about bacterial population homework problem (ie. how long will it take for the mass of Salmonella to equal the mass of steak? ), and then Dan got up to speak. Dan described himself as the “purity guy” as opposed to the Ferran Adrias of the world. He was interested in the “manipulation” of food before harvest, and the pursuit of flavor in the ingredients themselves. “In spring of 2004, Blue Hill at Stone Barns opened within the Stone Barns Center for Food and Agriculture in Pocantico Hills, New York. The Barbers helped create the philosophical and practical framework for Stone Barns Center, a working four-season farm and educational center just 30 miles north of New York City, and continue to help guide it in its mission to create a consciousness about the effect of everyday food choices. The amount of research and development at Stone Barns, by Dan’s presentation, is insane. And all of it, in the pursuit of great food. Dan’s first “recipe” was lamb. How do you get the perfect rack of lamb? Stone Barns starts with Finn-Dorcet sheep, a crossed-breed sheep that is half Finnsheep and half Dorset breed. Then you give it room to graze. Now, it’s not free to roam per se. A farmer fences in a large area of grass for the sheep to graze in (“free range” is a bit of a misnomer – they are free to roam within an alloted area). Over the course of the day, the fence and the sheep are moved. There’s a variety of reasons here. First off, grass-fed livestock is going to be superior over grain-fed livestock. Sheep and cow are herbivores and herbivores have a part in their digestive system called the rumen which is specifically designed to process grass. If the herbivore is put on a grain diet, the rumen does not function as it is supposed it. (Explained to me by a nutritionist once, the digestion system goes from alkaline to acidic, and it’s the acidic digestive system that encourages bacteria growth.) A grain fed animal will suffer increased likelihood of sickness which in turn increases antibiotics/steroid use for animal health. A grain fed animal will also see fast growth, increase in wrong fats, and diluted flavor on the palate of the diner. Dan showed us a slide of two racks of lamb, one grass fed and one grain fed. The eye of the meat was essentially the same size, but the grass fed rack suffered from twice the amount of fat and thereby looked two times larger than the grass fed rack. Gross and fascinating, right? Throwing out all that extra fat is like “throwing out Iowa” and just increased waste. So what about the grass grazing rotation? Sheep search for the sweetest grass to eat and the sweet grass is embedded into their memories. Grass at about 4″-6″ tall and are sweet will have the best nutrient density for the animal. If given a choice, a lamb will return to the same spot of sweet grass over and over again. However, this will exhaust the grass, discourage it from growing back, and create empty spots on grazing land. After the sheep are forced to move, chickens are allow to roam around the spot just vacated. Chickens will eat bugs around the manure (ewww!) and scratch/distribute the manure around more evenly which will encourage better fertilization (still kind of ewww even if I know it’s nature/necessary). Even spread of manure will also mean less empty spots of grass on grazing land. Stone Barns determines their grade of meats via a sonogram on the 12th and 13th rib. Why bother, you might be asking. Aren’t you just going to kill the animal for meat? Well no, not necessarily. If you know a particular animal has superior meat for cooking, wouldn’t you want to try to breed it and re-create its fine features? Stone Barns does. And so they use a sonogram. The next “recipe” was cured meats, meaning pork. Stone barns will be crossbreeding Berkshire pigs (which can live in colder Northeast conditions better than other pigs) with Ossabaw boars (closest thing to a wild boar and has good fat distribution). It’s almost crazy the amount of data that the farm is compiling. Controlling the pig diet within the free range category means manipulating the forest floor where the pigs will graze. Stone Farms has thinned out a forest area on its property and is growing a variety of grass that will be nutritious to their pigs. But what of all the trees that were cut down for the pigs? No worries, Stone Farm given purpose to the wood. Half of the wood is used for grilling (so Dan and the Blue Hill restaurant has been doing a lot of grilling recently as opposed to a couple of years ago) and half of the wood is dedicated to biochar. From what I can tell, it is a charcoal like product that is meant to be mixed into the soil like a super fertilizer or like an extreme vitamin boost to the system. It sounds like it can do other environmentally awesome things (on cursory glance), but we’ll keep this conversation within the use of Stone Farms. Stone Farms pulverizes the biochar and mixes it with their soil. This along with their composting methods means that their dirt has a huge retention of water and nutrients, and a positive impact on their farmland and environment. Dan showed us a slide of artichokes growing in dirt with biochar and in dirt without. It’s not a formal science experiment by any means, but the artichokes growing in the dirt with biochar were growning faster and larger. And some links if you are curious!